How do you become an RYA PWC (jetski) Instructor? Why train with us? Onboard or in the UK? We have the largest and newest fleet of PWC's available for training in the UK. This not only means you will be getting to use the most up to date kit on the market, but also it allows you the flexibility to put as many or as few of your crew through their training course as you wish. Unlike other centres who can only offer training for up to 6 students, we can offer training for up to 16 students! However, you will still have quality and a personalised service as we will never exceed the a 1:6 trainer: student ratio. In addition, we are located a stone's throw from Bournemouth International Airport and are approximately 1 hour from Southampton International Airport - both gateways from the most popular Superyacht ports in Europe such as Antibes and Palma. 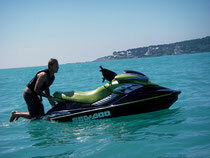 We provide all the kit: Jetskis, wetsuits, Buoyancy aids etc - so all you have to do is turn up! We appreciate that spending time away from the Yacht for Training can be difficult. Therefore we can provide RYA PWC Instructor Training from your yacht or location for up to 6 people. This enables senior crew to take the training and effectively supervise junior staff who are more likely to be operationally involved with the PWCs. Click here for further information about onboard Training. Do you have more than 1 crew member needing to be Trained? Once you have become an RYA PWC Instructor to run the RYA Introduction to Personal Watercraft Safety Course onboard your Superyacht you need to apply for RYA training centre recognition for your Superyacht. Details and information on how to apply for recognition, the process and whats involved can be found here. Instructor to student ratio: 1 instructor can supervise a maximum of 3 PWCs with up to 2 students on each craft. A safety boat or coaching craft may also be used as a teaching platform.